From Wadi Rum , you and your guide will ride camels to Lawrence Spring, where you will have the opportunity to climb the rocks to the spring. From the spring, you will be rewarded with an amazing view of the desert and Wadi Rum. Next you will go to the Red Sand Dunes, which you can also climb. While you climb the Dunes, your guide will prepare lunch and Bedouin tea so that you can relax and enjoy your lunch. After this, you will go to Um Ishrin, where you will meet a jeep that brings your luggage. Your guide will cook a delicious Bedouin dinner over an open coal fire, and you can enjoy the cool desert air and the solitude before going to sleep under the stars. On the second day after breakfast, you will go by camel to the beautiful Burrah Canyon. In the middle of the expansive canyon, you will stop to rest while your guide prepares lunch with Bedouin tea. After eating lunch and relaxing, you will ride to the Lawrence House, where Lawrence of Arabia stayed with his army for two weeks. Here you will meet the jeep with your luggage, and your guide will cook another Bedouin dinner. You can enjoy the campfire and sip Bedouin tea until you go to bed under the incredible night sky. On the third day after breakfast, you will go by camel to Khazali Canyon, which feature ancient inscriptions from the Nabatean and early Arabic periods, as well as being a great place to take a short hike. Then you will ride to the Little Bridge, which you can climb to enjoy the view from the top. Here, your guide will choose a nice place to prepare your lunch, and you can eat, drink Bedouin tea, and relax for an hour before continuing your trip. After lunch, you will ride to the Burdah Rock Bridge, where the jeep will meet you with your luggage. Your guide will cook dinner and you will enjoy your third night under the stars. On the fourth day after breakfast, you will ride to the Um Frouth Rock Bridge, where you can climb and enjoy the view. Since this is a long ride to the bridge, you will rest here while your guide makes lunch. Then you will ride to the sparse but starkly beautiful White Desert. Your guide will choose a good spot to spend the night, and a jeep will come to drop off your luggage. You will enjoy a Bedouin dinner with Bedouin tea and spend your fourth night under the stars. On the 5th day after breakfast, you will continue your journey through the expansive and lonely White Desert. In the middle of the day you will stop and have lunch. After lunch you will begin to ride out of the White Desert towards the sunset place. As usual, the jeep will meet you with your luggage and your guide will cook a Bedouin dinner. You will enjoy your fifth night under the desert stars. 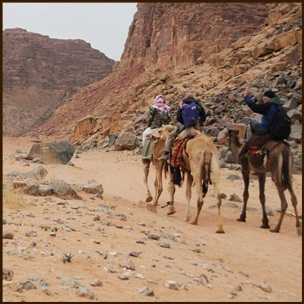 On the 6th day after breakfast we will drive you back to Wadi Rum village by jeep.